Game 22, 23, 24 – Reds Weekend, Where Did the Bats Go? I had a nice visit to Pittsburgh this weekend. I went to the game on Saturday night, which turned out to be the best game of the weekend (and the only game where a Pirate crossed home plate). It was also marathon weekend in Pittsburgh, so I enjoyed watching some friends run all over the city on Sunday. Game 22 – Zach Duke pitched well (7 innings, 1 ER), but he got absolutely no help from the hitters. Bronson Arroyo shut down and shut out the Pirates, allowing 4 hits in 8 innings. This loss marked the 2nd game in a row where the Bucs were shutout, and it put the Pirates back to .500. Game 23 – The Pirates got started early, putting 4 singles, a walk, and a HBP together to score 4 runs in the top of the 1st. Later, the Bucs got some help from a Brandon Phillips error that allowed 2 runs to score. In the top of the 9th, with an 8-4 lead, Matt Capps nearly imploded, but he survived with an 8-6 finish. Once again, the Pirates were a game above .500. Game 24 – The thrill of victory was short-lived, as Johnny Cueto and Jeff Karstens took to the mound at 1:35 on Sunday afternoon. 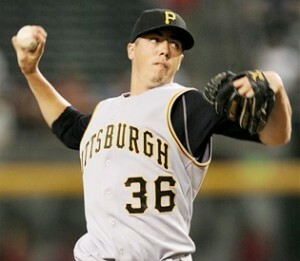 Karstens looked bad, as he gave up 5 runs in 5 innings. Again, the Bucs never got the bats moving, and they were shutout for the 3rd time in 4 games. No Pirate batter reached 2nd base in this game. 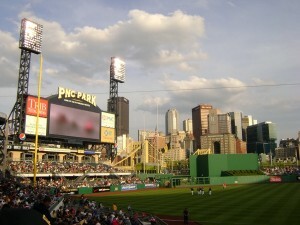 Back to .500, and the Brewers are coming to PNC for a 2-game series. – We really need Ryan Doumit and Jack Wilson back in this lineup. Jen Langosch reported that Jack Wilson took some batting practice swings on Sunday. Ryan Doumit will rejoin the team on Friday. – Who’s hot? – Delwyn Young looks good in the PH role. He’s 3-7 with 2 doubles. Other than giving up the 3 run homer to Lance Berkman on 4/16, Sean Burnett has pitched clean in relief. There shouldn’t be a rain-out today, so we’re finally going to see Jeff Karstens take the mound. Andy LaRoche is starting again at 3rd. Ryan Doumit will get a rest today, and Jason Jaramillo will take on catching duties. It’d be really nice to win this series against the Astros. Russ Ortiz @ Jeff Karstens – 12:35 P.M.
Update: Disappointing game. The Pirates got 10 hits, but they could only convert them into 3 runs. Both teams scored three runs early. Lance Berkman hit a 3 run homer off of Sean Burnett. – Andy LaRoche finally got his hit. – Not a great outing for Karstens, giving up 3 runs, 4 hits, and 5 walks in 4 IP. – We’re officially below .500 for the first time this season.